We've all been there—when you have worn out your yoga mat or just bought your first one and your hands just keep slipping in Down Dog. If this has happened to you, you're gonna love this week's giveaway! How to join: Simple—just leave a comment below! Yoloha yoga mats are hand-built with 100% recyclable, eco-friendly materials to give you a natural cork surface that cleans itself and has an unmatched grip that increases the more you sweat. The Yoloha cork yoga mat measures 72" length x 24" x .25" thick and weighs 6 pounds. 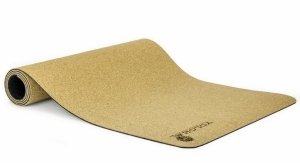 The quality of cork used guarantees that your mat won't chip, rot or break down over time. Guaranteed to last for decades (not just years), all Yoloha mats are handmade locally in the USA and are ready be used right out of the box—no break-in period required. The limited edition sacred geometry design is ingeniously oriented at 45-degree angles to help you maintain your alignment in Warrior poses. Using a state of the art printing technology, this body and environmentally kind print design will not wear off or affect the grip. Want your own Yoloha yoga mat NOW? Lucky for you, Yoloha is also offering a DoYouYoga-exclusive discount of 12% for all orders placed on their online shop. Just key in the code DOYOUYOLOHA to avail of the discount upon check out. The contest ends July 21, 2015, so go ahead—Tweet, share, and comment away, and you could be this week’s lucky giveaway winner! Congratulations to @annacc515 and @stubot for winning the giveaway!